A personal cosmography for harp, guitar, voice. D-Squared has discovered a whole new breadth of expression for the instrument. Deb Gessner’s harp interweaves gracefully with Don Charles’ guitar and vocals, to create a new sound on the face of the singer/songwriter scene. The result is a stark and hypnotic landscape of sound deftly drawing the picture of the great Southwest, their home. In their music, this duo from Arizona has chosen to tackle tough issues and the meaning of it all. The result is well worth checking out. Big Sky Full O’ Dumb Stars continues where the first recording left off ("matter of life & death"). 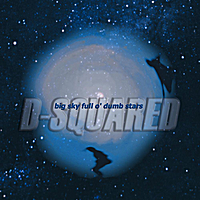 Featuring original songs that explore the sometimes bizarre, sometimes intense environment of what we call life, D-Squared manages to capture the humor as well as the joy and the pain. Their love of music shines through on this recording. There is a wider diversity of sounds on this second recording although the harp still features prominently on many of the tunes. When it is a featured instrument, it is deftly used to provide variety to the music. Small harp riffs keep the music interesting, without overpowering the subtleties created by the varying sounds. Along with the harp, guitar and well-blended vocals are occasional uses of tenor banjo, mandolin, psaltery, accordion, concertina, harmonica and percussion. This CD ranks very very very high among my favorites. Don and Deb are among the most talented human beings on the face of Earth as we know it. I treasure my own personal copy.